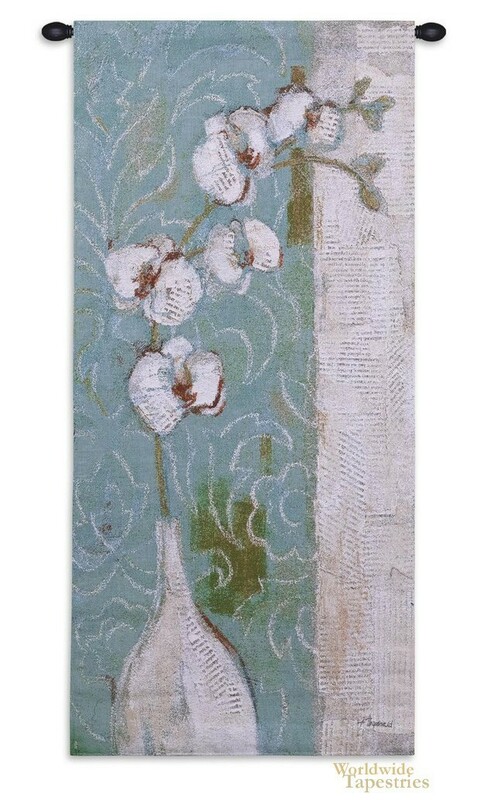 Spa Orchid' is a contemporary tapestry based on the original work of Helen Theobold. The exquisite use of seaside colors and swirling forms makes this contemporary piece a delight in any room that requires a modern, botanical touch. Theobold lives on the south coast of Hampshire by the sea, and her works are influenced by the natural elements that surround her. Her works are in private and public collections including the Bank of England. This tapestry is backed with a lining and has a tunnel for easy hanging. Note: tapestry rod and tassels, where pictured, are purchased separately. Dimensions: W 27" x H 52"